When you think of grinding fresh coffee beans, do you picture a modern day electric coffee grinder or one of the many beautiful antique coffee grinders of decades past? From the time of the ancient Egyptians people have been grinding coffee beans into powder to enjoy the delicious drink they could make from the powder. For many years a stone, wooden or iron mortar and pestle were used to grind the beans. However, housed in museums in both the United States and Europe are examples of the exquisite bronze coffee mortar and pestles from the seventeenth century that belonged to the affluent of the times. These beautiful utilitarian objects are examples of the craftsmanship of the Dutch, German and English. Richard Dearman was granted a patent for a new type of English coffee grinder in 1789. The first American patent for an improved coffee grinder was granted to Thomas Bruff Sr. In 1798. His invention was the beginning of the wall mounted coffee mill. 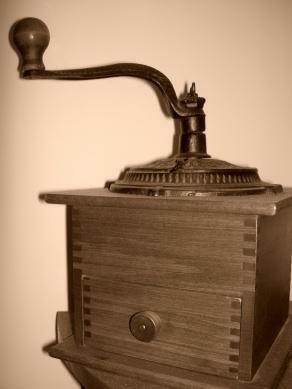 American Alexander Duncan Moore was granted a patent for an improved type of coffee grinder in 1813. A beautiful example of an early oriental coffee grinder in an Indo-Persian design is housed in the Metropolitan Museum of Art in New York City. Made of teak wood and brass, this magnificent nineteenth century coffee grinder, also known as a coffee mill, is decorated with red and green jewels. Within the teak wood are inlays of ivory and brass forming an exquisite pattern. This antique treasure can be viewed on page 600 of William Harrison Ukers All About Coffee on Google books.Another fabulous coffee mill belonged to the mistress of Louis XV, Madame de Pompadour. She describes a golden coffee grinder in her inventory of 1765. The coffee mill, made of gold, was adorned with carvings of colored gold in the image of the branches of a coffee tree. Although these types of antique coffee mills are not for the average collector, there are numerous antique and vintage coffee grinders that are available at auctions and antique shops both on and off line. However, before purchasing an antique coffee mill always make sure that the item is advertised correctly and that it is not a marriage, which is a combination of pieces from different models. The following websites include hundreds of photographs and sketches of antique coffee mills, valuable information and useful links. The Association of Coffee Mill Enthusiasts, known as A.C.M.E. The hobby of collecting antique coffee grinders is growing in popularity as more collectors are finding these beautiful and decorative antiques are also very useful. Many coffee afficionados claim that once you have tasted coffee ground in an antique coffee mill you will never go back to a modern electric model.